The Simple Programmer is opened from the Main Page of DecoderPro Action menu. 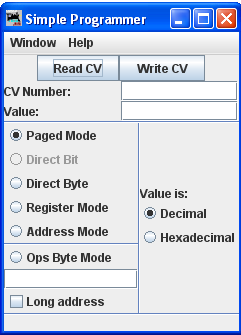 The Simple Programmer allows you to read or write CV values in DCC decoders one at a time. Prior to reading a CV value you should enter the CV Number (address) into the CV Number text box. If writing a CV value you should enter the CV Number and then a value in the Value text box. You may enter the value as Decimal or Hexadecimal depending upon the option selected in Value is: area. On the left side of the window you can select the Programming Mode. Any mode not supported by your command station will be grayed out. If you select the Ops mode, which programs on the main track, you need to enter the address of the decoder (locomotive) that you are programming. Your DCC system may require you to check the Long address check box if the address is a long address. Most DCC systems do not allow you to read on the main, if so, the Read CV button will be disabled. Now that you have everything setup, you may read the current value in the decoder's memory from the CV by clicking on the Read CV button or write your new value to the CV by clicking on the Write CV button.